The United Dutch East India Company was the first public company, preceding the formation of the English East-India Company by over 40 years. Its fame as the first public company which heralded the transition from feudalism to modern capitalism and its remarkable financial success for nearly two centuries ensure its importance in the history of capitalism. Although a publicly owned, highly complex and diversified business, and commonly agreed to be the largest and most profitable business in the 17th century, throughout its existence the Dutch East-India Company never produced public accounts of its financial affairs which would have allowed investors to judge the performance of the Company. Its financial accounting, which changed little during its lifetime, was not designed as an aid to rational investment decision-making by communicating the Company’s financial performance but to be a means of promoting sound stewardship by senior management. This study examines the contributions of accounting to the remarkable success of the Dutch East-India Company and the influences on these accounting practices. 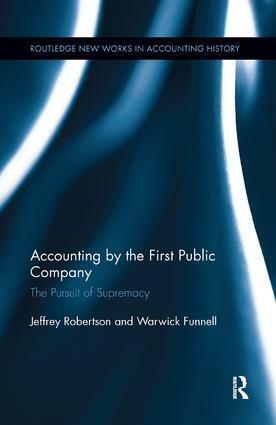 From the time that the German economic historian Werner Sombart proposed that accounting techniques, most especially double-entry bookkeeping, were critical to the development of modern capitalism and the public company, historians and accounting scholars have debated the extent and importance of these contributions. The Dutch East-India Company was a capitalistic enterprise that had a public, permanent capital and its principal objective was to continually increase profit by reinvesting its returns in the business. Rather than the organisation and management of the Dutch East-India Company reflecting the perceived benefits of a particular bookkeeping method, the supremacy that it achieved and maintained in a very hazardous business at a time of recurring conflict between European states was a consequence of the practicalities of 17th century business and The Netherlands’ unique, threatening natural environment which shaped its social and political institutions.